So after a few days of not being on my computer I finally got back on and made a complete pack of the OSX Leopard theme. I know a lot have been put out lately, but I haven't seen a full set yet so I figured why not. As with my old leopard 3d dock set, I have included my reflection template as well for everyone who wants to put shadow and reflection on there own icons (you need to have Photoshop). And finally I have to give credit to a fellow skinner, Messiah1 for his contributions to this theme. Without his help I wouldn't have been able to finish this, thanks buddy. Nice work putting it all together. Would have liked more Diamond plated stuff, but the complete package looks great! No problem bud. Always willing to help out a fellow dock artist. Good job. I was trying some stuff with the diamond plating and it wasn't look right so I just dropped it, I probably will eventually make some other stuff. So if I do I'll let you know so I can send them to you. Who are you? and what do you have against Messiah1? Is someone jealous? these are nice, I think the tile looks really cool. It looks like each icon is on a table if you have reflections. Looks like you (& messiah1) have been working hard! Good job. BTW- I looked at your preview image and I was wondering where you got that "my documents" folder from? I really didn't do much of anything on this. TSA did the work, I just provided some tips. Silly question time, how do I import this theme in to ObjectDock? Once you have pasted the folder over restart OD (if it was already running) then the new docks should be added to your list. Sure I'd like to see it! This is really nice. Just looks really "good" on the screen. Great job. 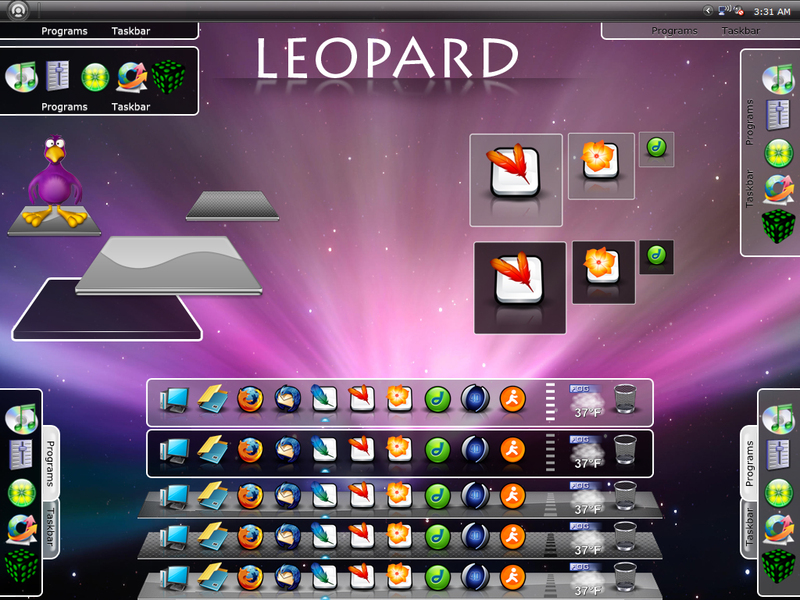 I am a mac user and love this Leopard OD theme. My PC at work looks as nice as my Mac at home thanks to this theme that gave my desktop the finishing touch. Thank you a million for this excellent theme. Hey, what windowblind is that? I can't seem to find it.